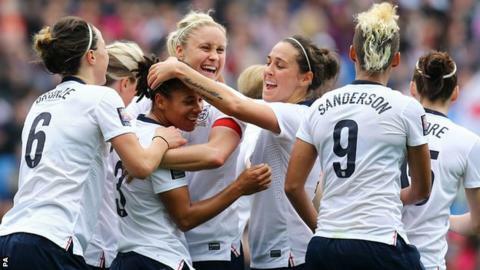 England manager Mark Sampson says the Women's Super League must avoid relying on foreign talent. The WSL expands to two divisions as it kicks off its fourth season on Wednesday, with the number of overseas players reaching a new high. In the women's top flight, 16% of players are from overseas compared to 64% in the men's Premier League. "World-class talent helps, but it's important that young English players have the opportunities," Sampson said. When the Premier League was formed in 1992, only 10% of starting 11s were from outside the UK. But since then, critics have complained that domestic youngsters have been denied playing opportunities by more experienced, and not always world-class, foreign talent. The number of English players under the age of 21 in the Premier League reached a new low last season while the men's England team have failed to make it past the quarter-finals of a major championship since 1996. The England women's team reached the final of Euro 2009 but were beaten in the last eight of the 2011 World Cup and went out at the group stages of Euro 2013. New head coach Sampson wants to avoid a similar trend occurring in the women's game. He told BBC Sport: "We have to make sure that our younger players are developed in the right way and, when they are good enough, they get the chance to play in the WSL. "That's the case now and we have to make sure it stays that way." Liverpool Ladies, last season's WSL champions, have six foreign players in their squad. That is the highest number in the league. In an attempt to match their rivals, Chelsea Ladies have signed high-profile foreign players over the winter and now have five in their side, while Arsenal have recruited Japanese World Cup winners Shinobu Ohno and Yukari Kinga. Sampson led former team Bristol Academy to a WSL and FA Cup runners-up spot last season with the help of Spanish strikers Natalia and Laura Del Rio, and he says they helped educate his young players. The situation is different from the Premier League where some teams - including Arsenal - have fielded teams without any homegrown players this season. Everton Ladies have an entirely British squad, with Birmingham City and WSL newcomers Manchester City employing one foreign player each. The WSL has a rule saying 50% of squads must be homegrown, meaning the players are developed in England for three years up to the age of 21. But Football Association women's football director Kelly Simmons added: "It's a challenge because, under European Union regulation, there is completely free movement. We restrict non-EU players coming in, but it's trying to get that balance right. "You talk to the players and they are learning from the top international players, but we have to make sure there is space for England youth players to come through as well."